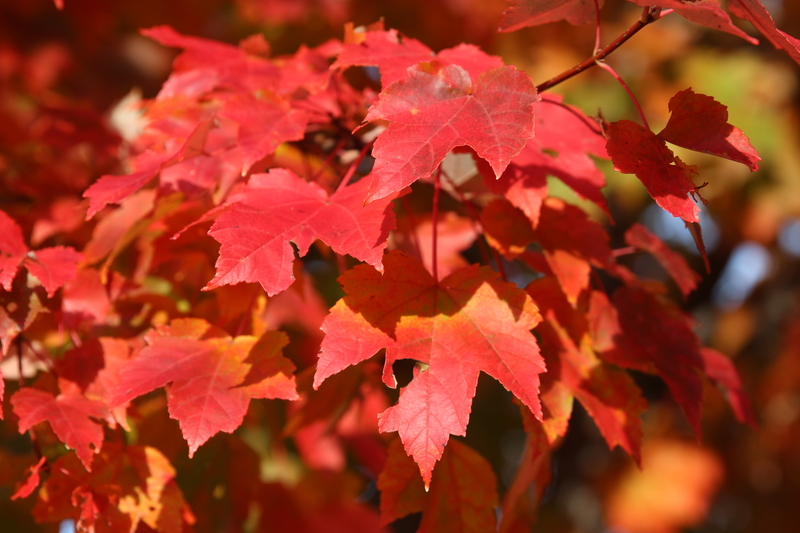 Close-up of a local maple tree with its leaves in full blazing scarlet. Okay, that’s not how the song goes. It’s been said that you haven’t truly experienced fall until you’ve at least gone shuffling through a carpet of red and orange leaves on the ground. Or, for the kids among us, gone diving headlong into a big, just-raked pile of leaves. For a lot of us, all those leaves are an essential, much-welcomed part of the season. And yes, for certain others, the leaves just mean another autumn yard chore. Indeed, this weekend, I saw all the suburban squires (to borrow a line from Gerry Goffin and Carole King) out in full force with rakes, leaf blowers and brown paper leaf bags. I freely admit that I’ve never understood the custom of bagging up your leaves and setting them out at the curb for the township to pick up. Granted, where I grew up we were surrounded by lots of woods, so we could just let most of the leaves decompose back into the forest floor – really not an option in suburban New Jersey. But even in the burbs you can mulch the leaves yourself or save some for the compost pile (need some carbon to mix in with all those nitrogenous kitchen scraps). Still, I think most of us would agree that there’s something pretty special about the leaves turning color and starting to fall. It’s as I said in a previous post – why else would fall foliage tours get their own ads in the paper, and the weather forecast carry updates on which trees are turning color in which regions? Why is autumn such a popular time to go hiking? Why are there so many sad songs that somehow involve the leaves coming off the trees – or just autumn in general? In my neck of the woods, we seem to be pretty heavy on maples, oaks (as is evident from the huge amount of smashed acorns on the sidewalk), hickories, elms, beeches and poplars. So, starting around mid-October or so, you get trees running the whole red-orange-yellow spectrum, from pale gold to flame orange to deep red to sort of a maroonish-brown. I remember heading to the Palisades for the park’s annual Halloween flashlight hike one year. It was still daylight – kind of heading on to dusk a bit – as people were arriving at the Alpine Boat Basin. And at that time of year, all the deciduous trees on the Palisades were starting to turn color – so the entire face of the cliffs, which is an expanse of mostly unbroken green in the spring and summer was decked out in shades of orange and brown. One of the other houses on my street has a tree out front, the leaves of which turn this beautiful shade of strawberry red in the fall. I’m guessing, according to my copy of New Jersey Trees and Wildflowers, that it’s a red maple. Which was true enough, because about 24 hours later, Hurricane Sandy blew through – and we had things other than autumn leaves on our minds, like power outages and gas rationing. The tree’s still standing, though. We haven’t had any storms of biblical proportions around here this year (knock on wood), but there’s rumors circling of a polar vortex coming around sometime over the next week. So enjoy that foliage while you can, folks.